Исследовательский проект "Английский национальный характер"
Инфоурок › Иностранные языки ›Другие методич. материалы›Исследовательский проект "Английский национальный характер"
Almost every nation has a reputation of some kind. For example, Russian people are said to be generous, open-hearted, kind; the Spaniards - noble and very proud; the French are supposed to be amorous and light-minded. And what about English people? 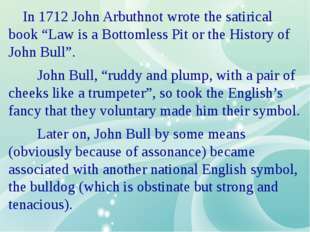 In 1712 John Arbuthnot wrote the satirical book “Law is a Bottomless Pit or the History of John Bull”. 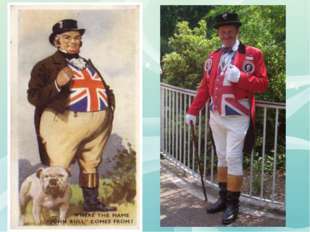 John Bull, “ruddy and plump, with a pair of cheeks like a trumpeter”, so took the English’s fancy that they voluntary made him their symbol. 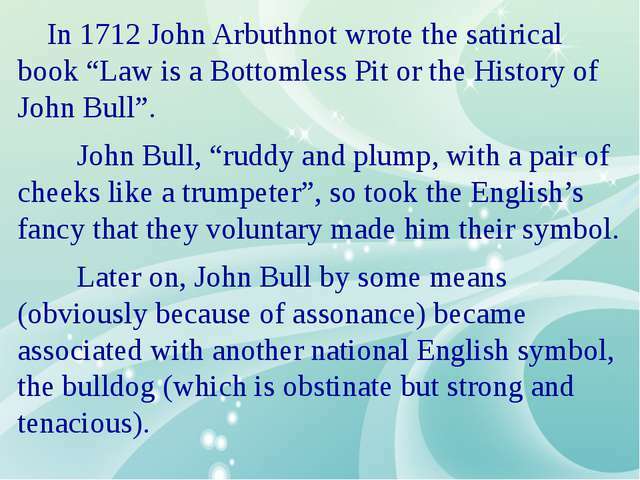 Later on, John Bull by some means (obviously because of assonance) became associated with another national English symbol, the bulldog (which is obstinate but strong and tenacious). 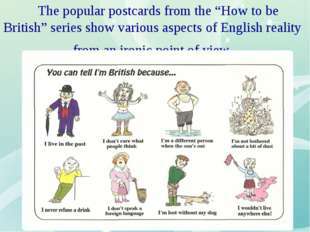 The popular postcards from the “How to be British” series show various aspects of English reality from an ironic point of view. 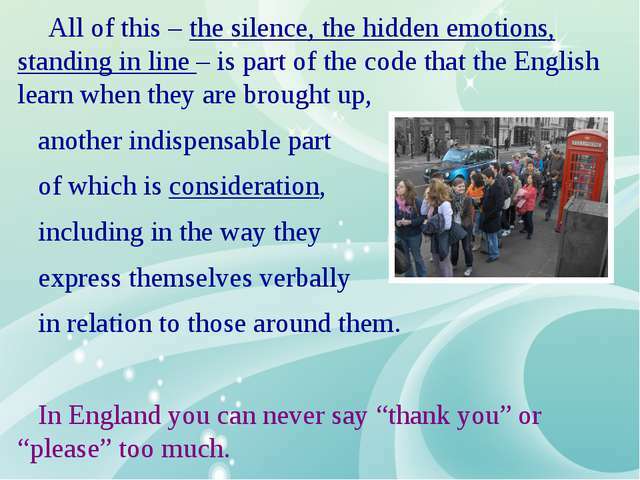 All of this – the silence, the hidden emotions, standing in line – is part of the code that the English learn when they are brought up, another indispensable part of which is consideration, including in the way they express themselves verbally in relation to those around them. In England you can never say “thank you” or “please” too much. The English have also gone down in history as clever entrepreneurs, energetic and tireless in thinking up ways to do business and enrich themselves. However, nowadays the English are often reproached for their lack of initiative and yearning for progress, for their desire to conserve the old and not change anything. The English, like any other nation, embody a number of mutually exclusive traits. This sometimes makes them a mystery to the outside world. The English probably have no more contrasts and contradictions in their nature than any other nation. 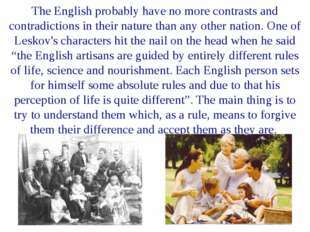 One of Leskov's characters hit the nail on the head when he said “the English artisans are guided by entirely different rules of life, science and nourishment. Each English person sets for himself some absolute rules and due to that his perception of life is quite different”. The main thing is to try to understand them which, as a rule, means to forgive them their difference and accept them as they are. 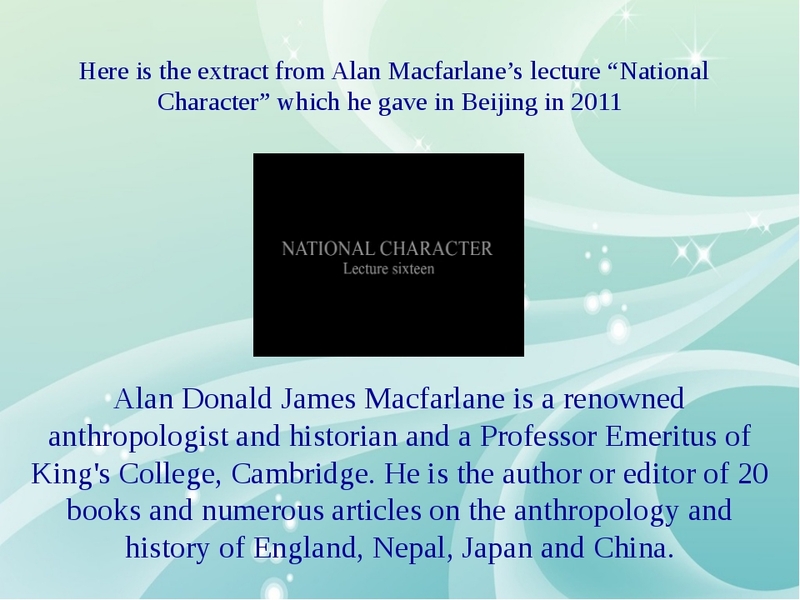 Here is the extract from Alan Macfarlane’s lecture “National Character” which he gave in Beijing in 2011 Alan Donald James Macfarlane is a renowned anthropologist and historian and a Professor Emeritus of King's College, Cambridge. 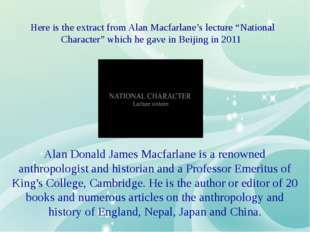 He is the author or editor of 20 books and numerous articles on the anthropology and history of England, Nepal, Japan and China. Работа посвящена описанию английского национального характера. Данный материал представляет собой творческий проект с мультимедийной презентацией. Процесс межкультурной коммуникации чрезвычайно сложен и многогранен. Для того чтобы общение с носителем языка было плодотворным и эффективным, необходимо в совершенстве владеть языком, знать его грамматику, особенности фонетики, лексического состава, а также обладать большим багажом знаний о традициях, обычаях, культуре данного народа. Именно поэтому работа «Английский национальный характер» актуальна: в ней автор продемонстрировала особенности национального характера, которые обуславливают поведение (в том числе и речевое) англичан. Для достижения цели автором были выполнены следующие задачи: изучен ряд русскоязычных и англоязычных источников аутентичного характера (учебная литература по страноведению, учебные пособия, аудио- и видеоматериалы, журнальные статьи, интернет сайты и т. п. ); выполнены отбор, анализ и систематизация полученной информации; переведены на английский язык тексты; подобраны и отредактированы фотографии, иллюстрирующие особенности английского национального характера; составлены несколько приложений, позволяющих читателю быстрее усвоить изложенный материал. Оригинальность проведенного исследования заключается в том, что изучение темы «Английский национальный характер» необходимо в течение всего обучения языку: каждая нация по-своему особенна и уникальна, и чем больше ученик знакомится с культурой носителей языка, его образом жизни, тем эффективнее будет осуществляемый им процесс межкультурного общения. Думаю, что данная работа заслуживает высокой оценки и может быть использована не только на уроках английского языка, факультативных занятиях по страноведению, но и на классных часах, при разработке программ элективных курсов. Учитель английского языка: Чернякова Т. М. Almost every nation has a reputation of some kind. 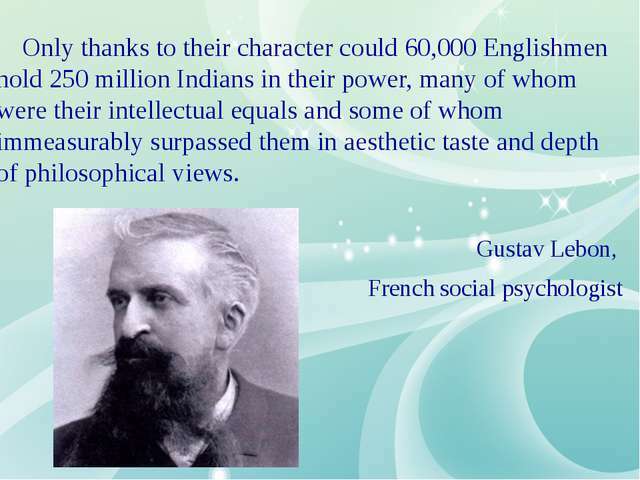 For example, it has been generally recognized that Russian people are generous, open-hearted, kind; the Spaniards are said to be noble and very proud; the French are supposed to be amorous and light-minded, the Germans are very efficient but rather dull; the Americans — boastful, energetic, technical-minded and easy-going. 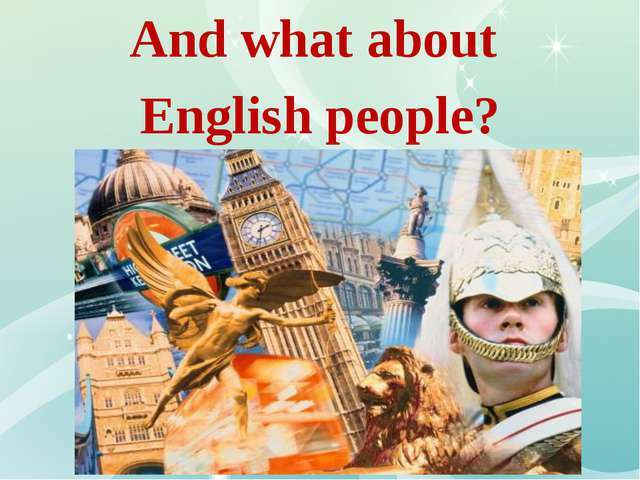 And what about English people? I tried to give the answer to this question in my precis “English National Character”. 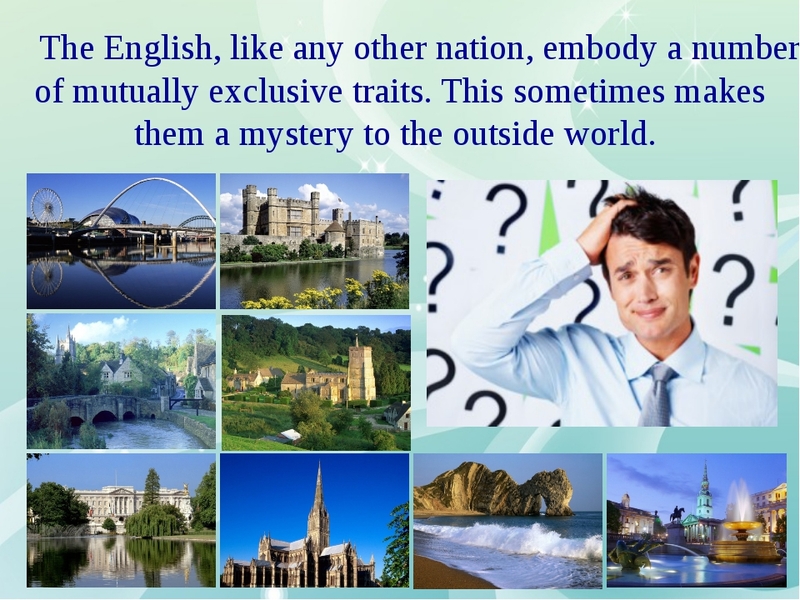 Why is it so important to know the main traits of the English? 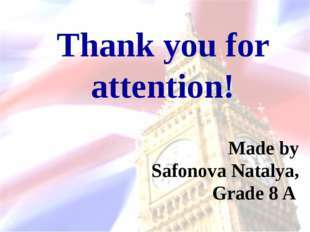 In fact, the difficult process of intercultural communication, in this case, with English representatives, demands perfect knowledge of English language, English history and traditions, the national character (the set of specific features that determine Englishmen’s behaviour and life style). It is necessary to understand the peculiarities of English national character to learn how to communicate with English people and, most importantly, to get some sort of pleasure out of doing it. It makes you proud to be British, doesn't it? The English character is, on the one hand, probably the most contradictory and paradoxical of all the European nations, and almost any element has an opposite facet. On the other hand it is very integrated and well defined, traceable back over many centuries. Much of the English character is put down to the fact that the country is an island and there is even the term “island psychology”. But there are many island nations around the world, and only one England. Obviously, you need a combination of various factors, the mixture into one melting pot of various peoples, the Brits, the Picts, the Celts, the Anglo-Saxons and many others, the contribution of the Roman and Norman invaders, and the spice of close contacts with their continental neighbours seasoned with their own victories and conquests. All of this, when put into a certain climate and a specific geographic location has led to the appearance of the race that is so different from the other Europeans. 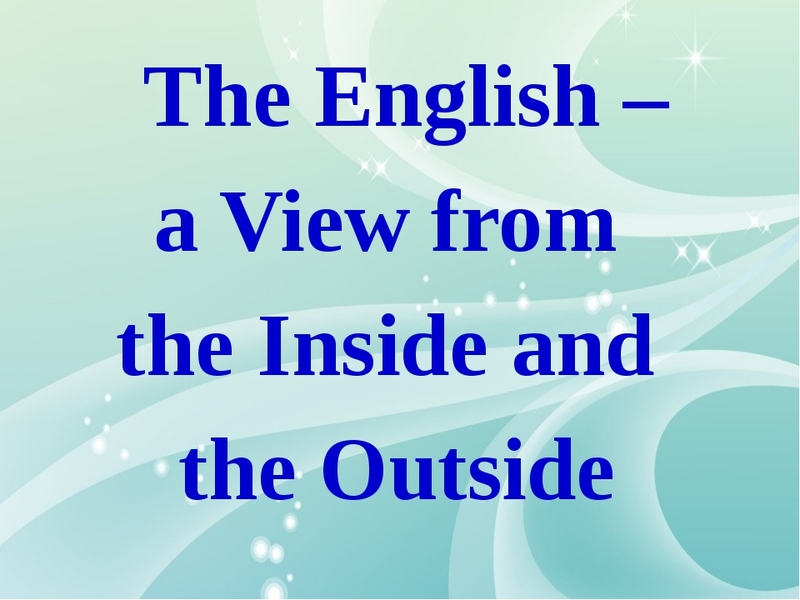 In order to try to make sense of what exactly it is that makes the English tick, it is better to try to look at them both from the outside (to pay attention to the opinions of external observers), and from the inside (to clarify what the English say about themselves). In 1712 a work appeared in England that had a strange fate: many people have heard of it, but very few have actually read it. It is the satirical work “Law is a Bottomless Pit or the History of John Bull” written by John Arbuthnot2, the creator of a literary and political circle, one of whose members was Jonathan Swift3. John Bull’s image so took the English’s fancy that they voluntary made him their symbol and this has now become so fixed that he can still be found in both the world press and in literature. Above all, it is interesting that he is a simple merchant, not a sailor of the seven seas, nor a poet, nor an explorer, as might have been expected at that time. He is “ruddy and plump, with a pair of cheeks like a trumpeter”. He is simple, honest, straightforward, is easy to trick, but he gets the bit between his teeth, he knows for certain what he wants and his common sense always shows him the right way out of any situation. 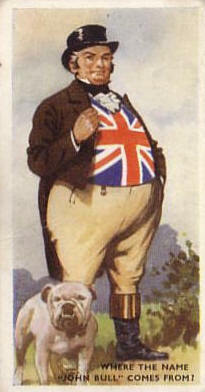 Later on, John Bull by some means (obviously because of assonance) became associated with another national English symbol, the bulldog (see supplement II), about which George Orwell4 wrote with a certain irony that “Millions of English people willingly accept as their national emblem the bulldog, an animal noted for obstinacy, ugliness, and impenetrable stupidity”. We should add that it is also strong, has great powers of endurance, and most importantly it is tenacious. And everybody knows that once a bulldog has grabbed something it will not ever let go. Here is a portrait of the average English man as described by father Robinson. Daniel Defoe's5 famous hero, urging his one and only son not to stick his neck out or ask for trouble, but to find himself the golden medium. “He told me... that mine was the middle state, or what might be called the upper station of low life, which he had found by long experience was the best state in the world, the most suited to human happiness, not exposed to the miseries and hardships, the labor and sufferings, of the mechanic part of mankind, and not embarrassed with the pride, luxury, ambition, and envy of the upper part of mankind.... He bid me observe it, and I should always find... that the middle station of life was calculated for all kind of virtues and all kind of enjoyments; that peace and plenty were the handmaids of a middle fortune; that temperance, moderation, quietness, health, society, ill agreeable diversions, and all desirable pleasures, were the blessings attending the middle station of life; that this way men went silently and smoothly through the world, and comfortably out of it, not embarrassed with the labors of the hands or of the head, not sold to the life of slavery for daily bread, or harassed with perplexed circumstances, which rob the soul of peace, and the body of rest; not enraged with the passion of envy, or secret burning lust of ambition for great things; but in easy circumstances sliding gently through the world, and sensibly tasting the sweets of living, without the bitter, feeling that they are happy, and learning by every day's experience to know ii more sensibly”. As we know, the son did not take his father's advice, and ended up paying dearly for it. We have already quoted George Orwell, who selected the following main characteristics of the man in the street: in his opinion the English were not interested in the arts, had a capacity for gentleness, respected the law, were suspicious of foreigners, loved animals up to the point of hypocrisy, were hypocrite, were riddled with class divisions, enjoyed games, especially football. 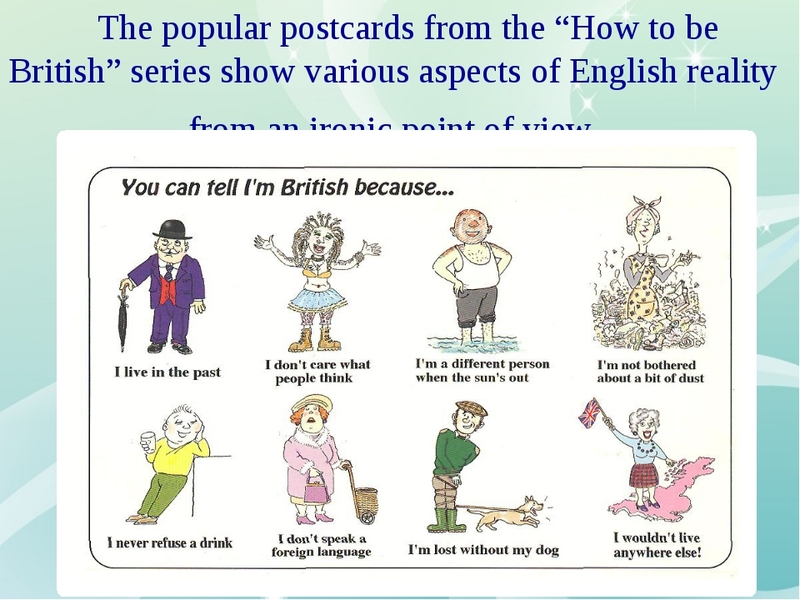 The popular postcards from the “How to be British” series, which are endlessly popular with foreigners visiting England, show various aspects of English reality from an ironic point of view. 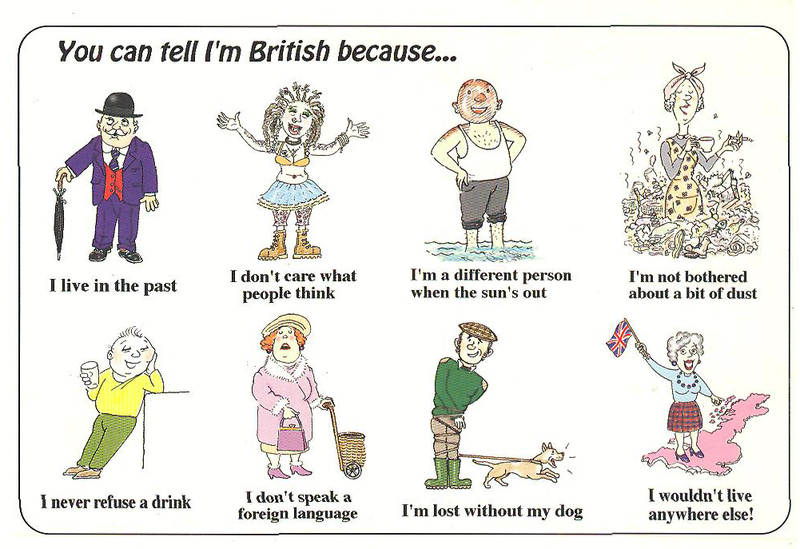 One of them, which is dedicated to the English national character, reads “You can tell I'm British because... I live in the past; I don't care what people think; I am a different person when the sun's out; I am not bothered about dust; I never refuse a drink; I don't speak a foreign language; I'm lost without my dog; I wouldn't live anywhere else!” (see supplement III). And finally, the “The Alien's Guide to Britain”6 describes the English character as follows: “The English see themselves as highly controlled warriors with a strong, patriotic sense of place, tolerant of others, mild of manner and lovers of order, reason and eccentricity. Others see this as hypocrisy - anyone as perfect as that couldn't possibly live with themselves... Common sense is born and bred into every Briton but amazingly not into anyone else. Hence the British feel dutybound to tell the world how to do (or more usually how they should have done) everything. Being wise after the event is another exclusively British talent”. On the whole, the English opinion of themselves is defined by two main moments7: on the one hand there is self-irony, a light dig at oneself, behind which, on the other hand is hidden a deep respect for oneself. Those shortcomings they find in themselves could easily be interpreted as advantages. The view from outside, as a rule, is more searching. But that is how it usually is with other nations too. The English, as we mentioned earlier, have been able to implant the rest of the world with a strange sort of respect for them and therefore there are not many foreigners who are prepared to judge the English. 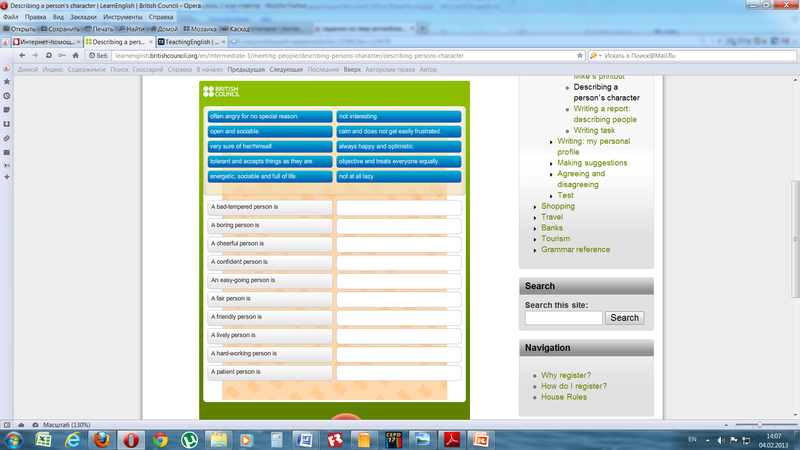 Much of what is particular to the English nation is linked with the system for bringing up children8. Naturally, there is always the question of the chicken and the egg, in other words which came first and which second. Did the way they bring children up affect the national character or did the national character influence the way they bring children up? As with the “original” chicken question, we shall leave the search for answers to children and philosophers, while ourselves turning to more serious results. The English system for bringing children up is based on the principle “don't spoil them!” From childhood, the English get used to sleeping in cold bedrooms, walking in the cold pouring rain without anything to cover their heads, they assume that punishment is a normal part of life, see their parents according to a strict timetable and set off into the wide world once they have reached a certain age called adulthood. 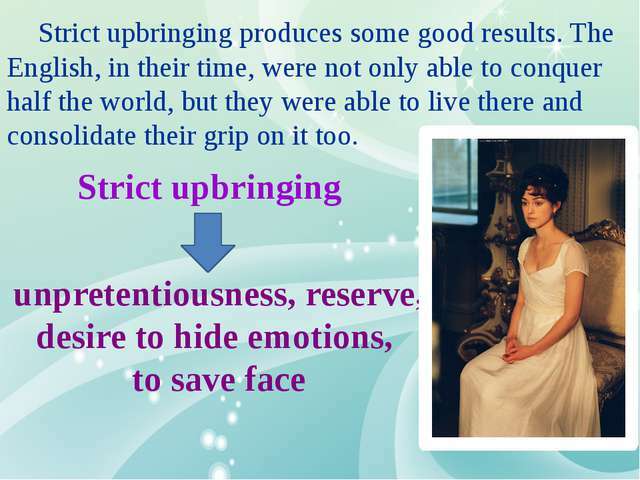 Such a strict upbringing, although it may sometimes arouse a natural perplexity, does produce some good results. The English, in their time, were not only able to conquer half the world, but they were able to live there and consolidate their grip on it too. Adventurers, sailors, explorers, this was what life was really about for the English, who were able to throw down the gauntlet to fate and were not afraid of difficulties. The cold and unhealed homes, walks in the rain as though nothing were amiss, dressing lightly in winter, these are also a challenge, maybe only on a small scale, but they are a small victory over one's own weaknesses and circumstances. A distinctive and important feature of an Englishman's nature is his unpretentiousness, which results from the strict upbringing. It is also the source of the famous British reserve, desire to hide their emotions, to save face9. There are not many things that can make an Englishman lose control. 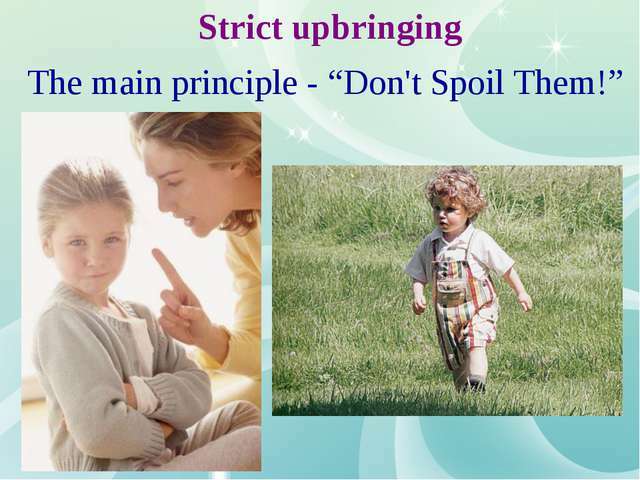 Restraint and self-control, which are often taken to be simple coldness, such are the life principles of this race. In cases when a representative of a sentimental Latin nation or a soulful Slavic one will be in tears of delight or emotion, the English will say “lovely”, a term which for them conveys the same intensity of emotion. Тhе only thing that will make an Englishman lose control is the loud and aggressive behaviour of others. Even in London, a city which is almost entirely given over to tourists and immigrants, you will often see a sedate English couple looking on with obvious disgust at a loud and emotional group of Spanish or Italian tourists. They will allow themselves, in an outburst of indignation, to raise their eyebrows and silently, indignantly exchange glances. The English restraint and reluctance to show their emotions tends to arouse even greater incomprehension, and sometimes even condemnation, from those around, either as emotional representatives of the romantic world, or as those from the sensitive Slavic world10. 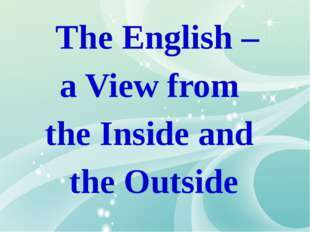 The English have rid themselves of all those qualities which are not necessary for everyday life. There it a well-known episode which took place in 1835 in the Syrian desert. An Englishman, who had been travelling on his own for a number of days, shared with his diary the feelings that overtook him when he unexpectedly saw in the distance the figure of a fellow traveller (who, as it turned out, was also an Englishman). As they came closer, the author worried about how he should act and what he should do. Should he start talking with this stranger, and if yes, than about what, or should he pass silently by or perhaps take a different course, or stop altogether. In a word, the situation was far from simple. As a result, when the travellers drew level, they silently raised their hands to their hats as a mark of greeting, waved their hands and went their separate ways. The camels showed more emotion: they did not want to part ways and stopped dead still, and as a result the two Englishmen were therefore forced into starting a conversation11. 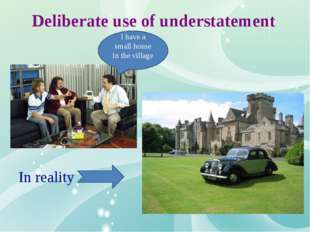 One other important component of the English nature it the deliberate use of understatement. If an Englishman tells you that he has a small house in the village, you may, upon arrival as his guest, note that he has a whole castle with three hundred rooms; a world tennis champion might well tell you that he plays not badly, and somebody who has just swum alone across the Atlantic might hint in passing that he occasionally goes for a dip. It is also interesting to note the differences between English and American advertising, which clearly illustrate the contrast between these two once close nations. In England, adverts for cold medicines usually look something like this: first, an ill, unhappy person in bed, coughing, suffering and in pain, then he takes the medicine and finally, still in his bedshirt but now in an armchair, smiling slightly at the camera (to show that he is now feeling a lot better). In America they advertise the same medicine completely differently: after taking the medicine, the sufferer immediately gets better, throws on a shirt and runs off, full of life and happiness, either to work, or to go and play tennis. 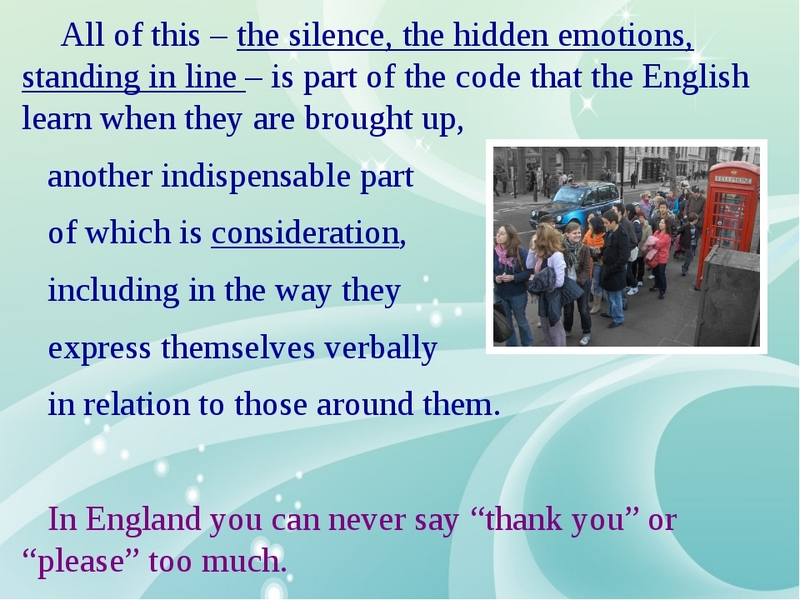 All of this – the silence, the hidden emotions, standing in line – is part of the code that the English learn when they are brought up12, another indispensable part of which is consideration, including in the way they express themselves verbally in relation to those around them. In England you can never say “thank you” or “please” too much, and it must be the only country in the world where you need to apologise if somebody else steps on toes. The consideration of English drivers always arouses the admiration of foreigners: they not only slow down to let you out, but smile and wave their hand while doing so, as if to say that it is they who are receiving pleasure from this. They are fanatical about stopping whenever they see a pedestrian on a zebra crossing, even in London. The English have also gone down in history as clever entrepreneurs, energetic and tireless in thinking up ways to do business and enrich themselves13. The story with French wine is typical. Wine has been produced in France since times immemorial, or at least it can be proven that the ancient Romans took great pleasure in the wonderful drinks from the area now called Bordeaux, but it required the English to turn this product, which had been for drinking at home, into an important source of income. In 1152, the English King Henry П married Eleanor of Aquitane and received a really quite good dowry: the south-western regions of France. From then until 1453, the end of the Hundred Years War, the famous region of Bordeaux with all its wines was under the power of the English crown. The English quickly came to appreciate the taste of the local wines and recognized their commercial value. As one of the French guidebooks to wines notes “the English came, tasted, and wanted”. As a result, the production of wine during this period (which the French call “English occupation”) was moved on to an industrial footing and it is at this time that the large scale trade to wine began. 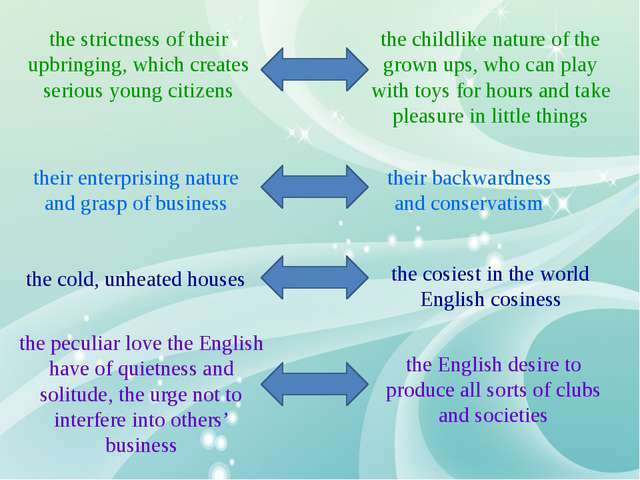 Nowadays, the English are often reproached for their lack of initiative and yearning for progress, for their desire to conserve the old and not change anything. Sometimes you can get the impression that this part of The English national character (i.e. business, prudence and activity) was “taken” to America by the colonisers, where it has taken root in the fertile soil and flowered plentifully. It may also be that the activities of the English never were more than a way to satisfy their own interests and create the conditions for their own comfort. Maybe they did not have that abstract love, or even passion, for business which wears out the Americans, without allowing them to relax and have a rest. We have already talked about, for example, the strictness of their upbringing, which creates serious young citizens, and the childlike nature of the grown ups, who can play with toys for hours and take pleasure in little things. Their enterprising nature and grasp of business combine with their backwardness and conservatism; the cold, unheated houses with the cosiest in the world English cosiness. The peculiar love the English have of quietness and solitude, the urge not to interfere into others’ business. Indeed as well as this, the inclination towards solitude lives successfully in harmony with the English desire to produce all sorts of clubs and societies; in this they have no equals. The multitude and variety is hard to comprehend. Just as it always was, many of the English “inventions” nave spread throughout the world and have become the property of the world, such as the Salvation Army. Everybody knows that English society retains more formalities than any other nation on earth. There are the ancient titles and honours, and me ornate forms of appeal which have long since dropped out of other languages, and the dress requirements in particular situations: bow ties, ties, hats, gloves, and on top of this you have to know what is acceptable for each occasion. At the same time, there is no less formal society than the English, in those situations (naturally) when so allowed by tradition. You can dress yourself in whatever comes to hand, have the most outrageous haircut, behave in the most peculiar fashion, and be sure that none of the English will pay the slightest attention. Firstly, because it is a country of cranks and eccentrics, and secondly because in England everybody is free to do whatever they like (so long as that does not contradict the traditional unwritten foundations of society) and finally, because restraint, self control and silence are considered to be one of the most important of life's rules14. The serious English are also famous comics. 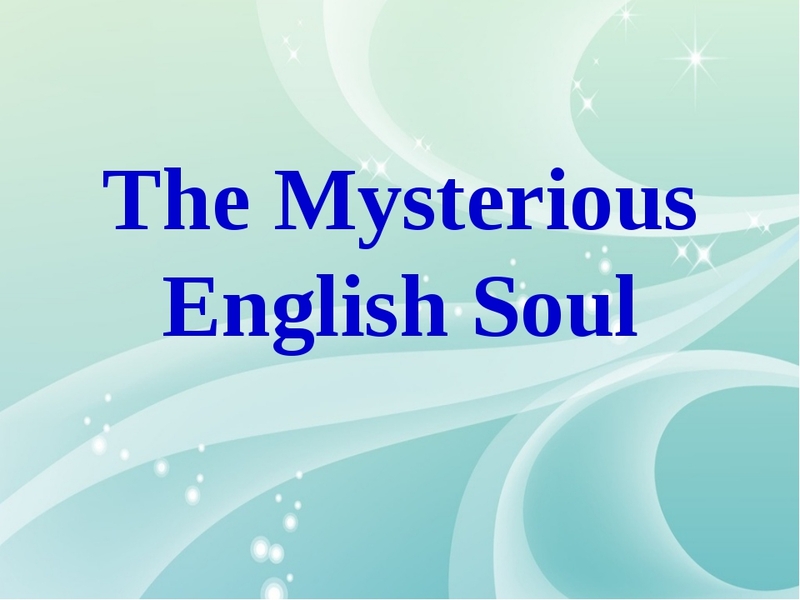 Let’s remember the “subtle English humour”, the secret of which is in its simplicity, the fact that there is no hidden sub-text, and that physiological humour is precisely that, providing an outlet for suppressed emotions and feelings. In an entirely different category is English irony and sarcasm. To laugh at oneself and at others comes naturally to the English15. This quality has been cultivated over many centuries, and is considered to be the highest achievement of a human being. 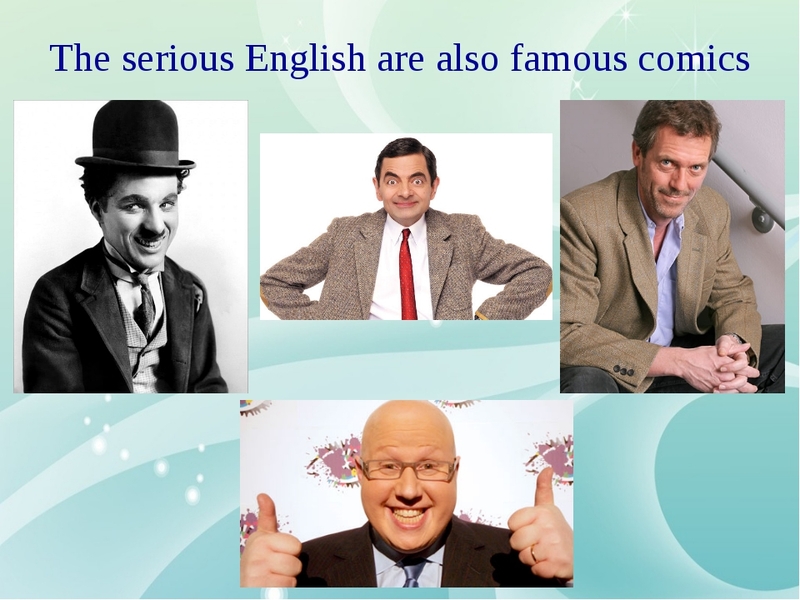 Puns, paradoxical sayings, pointed jokes, these are all part of the fame of the English nation and its language. Another apparent paradox is that the country which silently conquered the oceans and the lands, raises its children strictly, and does not tolerate excessive displays of emotion has created what is probably the richest collection of children’s literature and the richest children's world16. 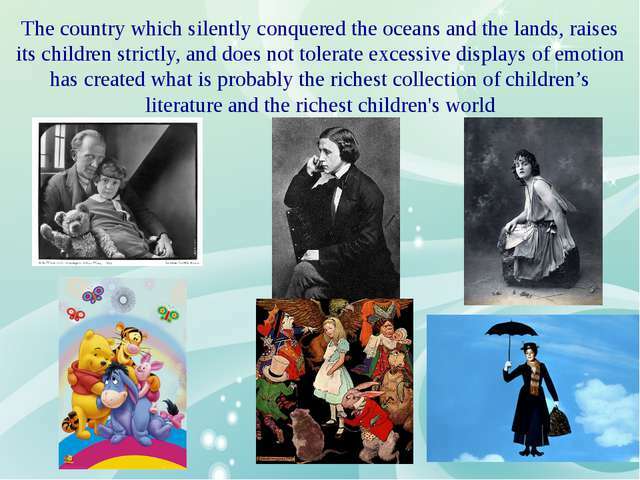 Alan Alexander Milne, Charles Lutwidge Dodgson (Lewis Carroll), Pamela Lyndon Travers, James Matthew Barrie – these writers are famous all over the world. 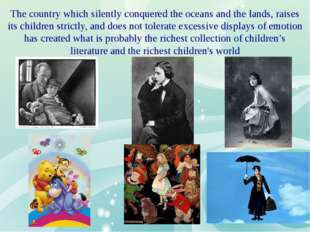 Their wonderful, touching characters have won the hearts of children and adults. 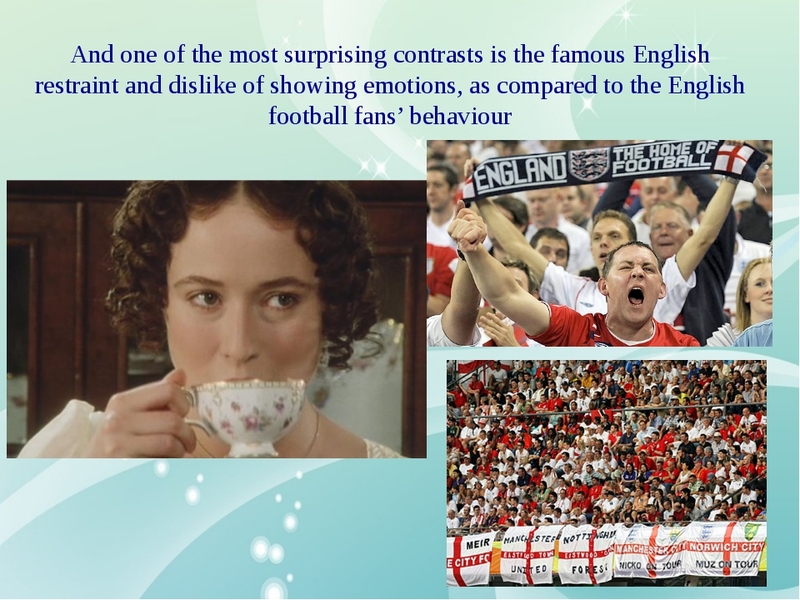 Finally, one of the most surprising contrasts is the famous English restraint and dislike of showing emotions, as compared to the English football fans who are, unfortunately, known throughout the world. When you travel in an English bus there really is a death-like silence, in restaurants they like to talk in whispers, and even in shops you will not find people noisily exchanging their impressions (apart from foreigners) but just try to go to an English pub on a Friday evening and you will be deafened by a wave of sound. Or if they are showing a football match on the television, then you are unlikely to be able to survive unless you have undergone specific acoustic training. 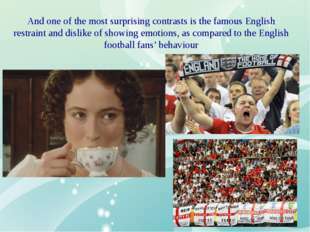 The English probably have no more contrasts and contradictions in their nature than any other nation. One of Leskov's17 characters hit the nail on the head when he said “the English artisans are guided by entirely different rules of life, science and nourishment. Each English person sets for himself some absolute rules and due to that his perception of life is quite different”. The main thing is to try to understand them which, as a rule, means to forgive them their difference and accept them as they are. 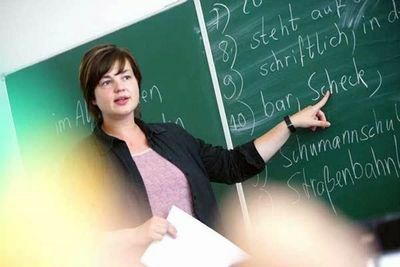 The English character is, on the one hand, probably the most contradictory and paradoxical of all European nations, and almost any element has an opposite facet. On the other hand it is very integrated and well defined, traceable back over many centuries. In my precis “English National Character” I described the main interesting features of English people. They deeply respect law, both written and unwritten, and strictly obey it. They never violate traffic order or game rules. The English are very polite and punctual. They control themselves and try not to show their feelings. English people are really devoted to animals and different kinds of sports. And perhaps the main trait that all the English have in common is their sense of humour. 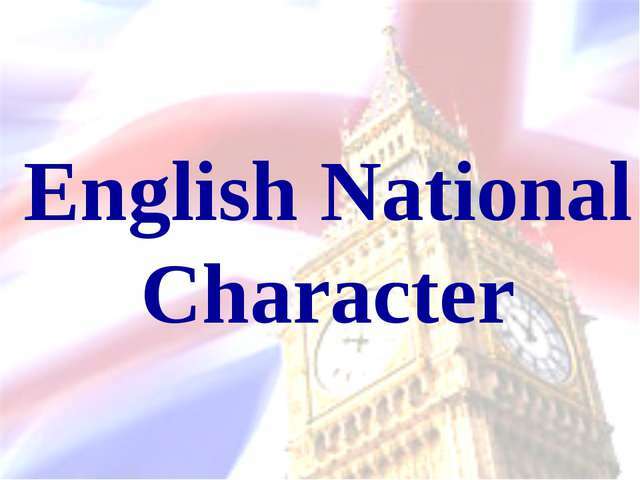 Knowledge and understanding of English national character are the key to successful intercultural communication. 1. Briggs Susan. English Experience. – L., 2003. 2. Bryson Bill. Notes from a Small Island. – Black Swan, 1996. 3. Cambridge International Dictionary of English. – Cambridge University Press, 2001. 4. Collons Anne. British Life. – Penguin Readers, 2001. 5. Davidson Martin. A Visitor’s Guide to a History of Britain. – BBC, 2002. 6. Mikes George. How to be a Brit. – Penguin Books, 1984. 7. Pavlovskaya Anna. England and the English. – M., Moscow University Press, 2005. 8. Room Adrian. An A to Z of British Life. Dictionary of Britain. – Oxford, 1990. 9. Smith Edward. Foreign Visitors to England and what they have thought of us. – L., 1889. 10. Watson Jim. The Alien’s Guide to Britain. – L., 2000. 11. Бурова И. И. Две тысячи лет истории Англии. Ч. I. – СПб, 1865. 12. Тер-Минасова С. Г. Язык и межкультурная коммуникация. – М., 2000. I, Safonova Natalya, a schoolgirl of 8A form, present you my project “English National Character” devoted to the specific features that determine Englishmen’s behaviour and life style. The process of cross-cultural communication is really difficult. Sometimes you may unintentionally offend a person because you don’t know his way of life, his value system. 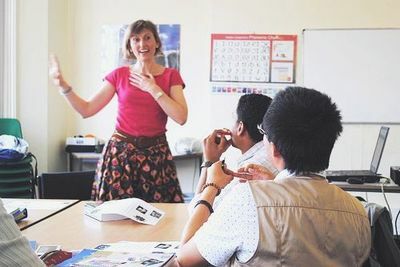 In order to avoid disappointing mistakes and misunderstanding you should not only speak English fluently but also know peculiarities of English national character. For example, the English are polite, punctual and reserved. They almost never lose control. Even if an Englishman is shocked or irritated, he will just raise his eyebrows in surprise. The English are devoted to their pets and gardens. Many of them have green fingers. And perhaps the trickiest thing to understand is subtle English humour. 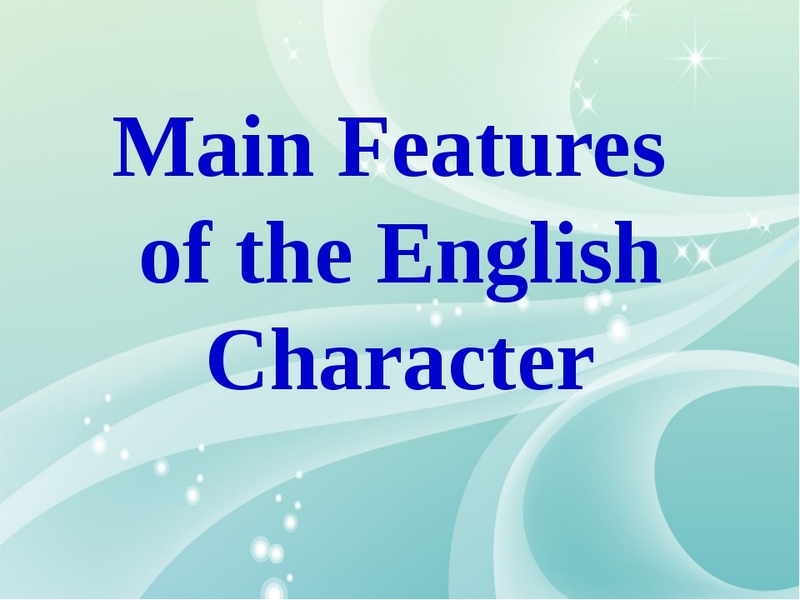 Of course the list of features of the English character can be endless. And in our case the more traits we know the easier it will be for us to communicate with English people. Я, Сафонова Наталья, ученица 8 «А» класса представляю проект «Английский национальный характер», посвященный особым чертам, которые определяют поведение и образ жизни англичан. Процесс межкультурного общения очень сложен. Иногда Вы можете неумышленно обидеть человека из-за незнания его образа жизни, системы ценностей. Чтобы избежать досадных ошибок и непонимания, нужно не только бегло говорить по-английски, но и знать особенности английского национального характера. Например, англичане вежливы, пунктуальны и сдержанны. Они почти никогда не теряют самообладания. Даже если англичанин шокирован или раздражен, он лишь поднимет в удивлении брови. Англичане любят домашних животных и сады. Многие обладают природными способностями к садоводческому искусству. И, пожалуй, самая сложная для понимания вещь – это тонкий английский юмор. Конечно, список черт английского характера может быть бесконечным. В нашем случае чем больше особенностей мы знаем, тем проще будет процесс общения с англичанами. 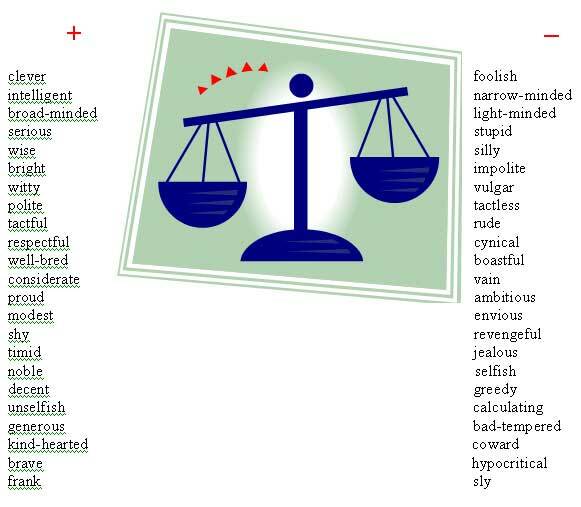 Here are some words which can be used to talk about someone's character or personality. Match the meaning to the character and personality descriptions. The English character and English history are interconnected. 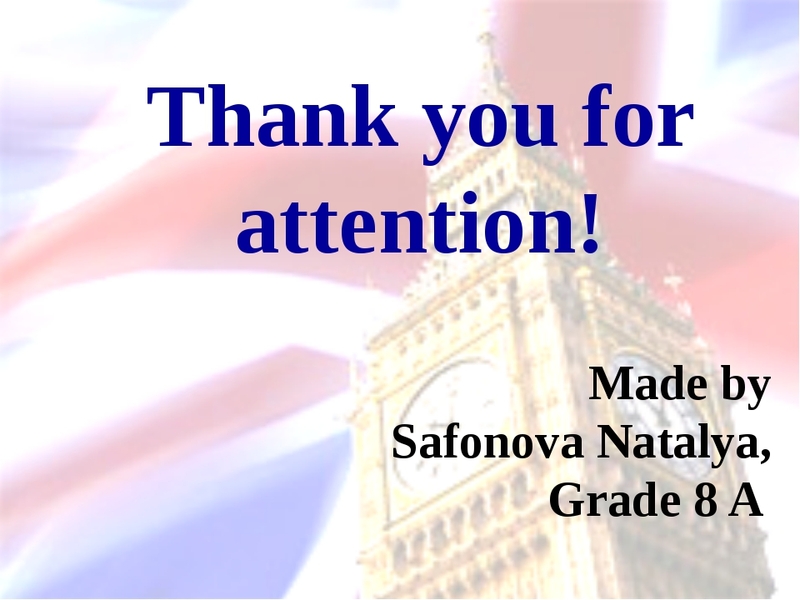 Here is the quiz “Do you know England?”.